Like humans do you have under streetlights also dwarves. Under a viaduct there is a small community of three small lampposts with all a Philips XGS 103 lantern (Lamp is SOX 35 watt). The posts are only two meters tall. LOL. I have seen dwarves before also, they like to inhabit below viaducts and bridges. Before those dwarf posts there were three bolders but those are very soon vandalised and before the bolders there was an setup like these. and how are these holding? All the streetlights under the bridges in Nijmegen where, after several damages permanently removed. This situation is now for a few years but the lanterns are easy to touch. 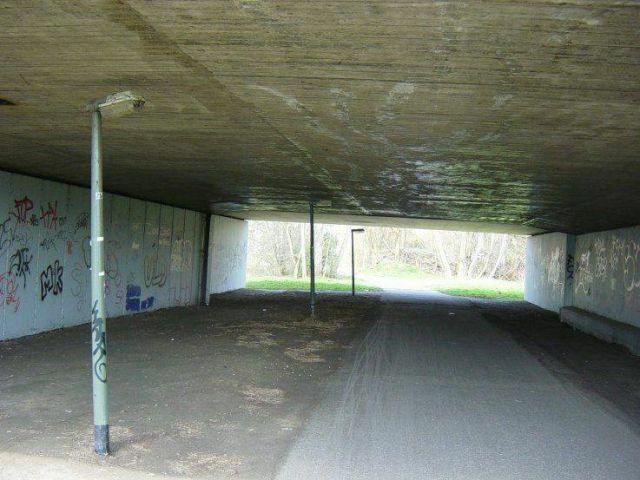 In the UK lights sre Mounted directly onto the roof of the bridges/subways and tunnels, in anti Vandal Fittings. In the Netherlands also on most spots. The lanterns on the picture are already vandalised. That is the reason that posttops in the Netherlands mostly used on 4 meter columns in stead of 5 meter columns i have seen in the UK. Avoiding light comes into sleeping rooms. The only disadvantage is that on spots in parks etc the lanterns are easier to vandalise.